Until the 2nd November the exhibition Walter Benjamin's Suitcases. Migrating devices was open at the customs hall of Portbou International Railway Station. The exhibition included imagined suitcases created by students and teachers from the École des Beaux Arts (Bordeaux), Weissensee Kunsthochschule (Berlin), Escola Llotja d'Arts i Disseny (Barcelona) and other residents from Casa de Velázquez (Madrid) based on Walter Benjamin's work and concepts. 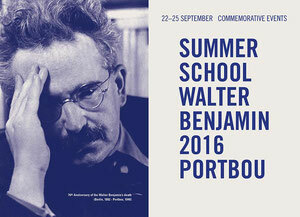 The first edition of the Summer School to Walter Benjamin within the Commemorative Events of the 76th anniversary of Walter Benjamin's death took place in Portbou from the 22th until the 25th September. The event was organised by Portbou Town Hall and the Associació Passatges de Cultura Contemporània. The first edition of the Summer School was directed by Sigrid Weigel (Zentrum fur Literatur und Kulturforschung Berlin), with the collaboration of Chantal Benjamin, grand-daughter of Walter Benjamin, social worker and training in Human Rights (Alice Salomon Hochschule Berlin) and Pilar Parcerisas (Assoc. Passatges). Among the participants were: Gerard Vilar (UAB) ), Enric Puig Punyet (writer at the journal La maleta de Portbou), Natàlia Cantó (UOC), Swen Seebach (UAB), students and professors from École des Beaux Arts (Bordeaux), Weissensee Kunsthochschule (Berlin), Escola Llotja d'Arts i Disseny (Barcelona) and residents from Casa de Velázquez de Madrid, all of them participants in the exhibition The briefcases of Walter Benjamin. 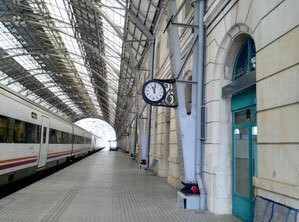 Dispositifs of migration at the Portbou Internacional Railway Station. On Sunday 25th the event closed with the presentation of the project of declaration of the Passages Memorial by Dani Karavan as a National Cultural Good and wreath laying and official speeches at Portbou cemetery. 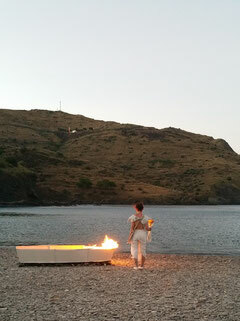 On July 15th the Japanese artist Shino Yanai made in Portbou the performance titled "The Blue Passages" She crossed the Pyrenees from Banyuls to Portbou through the Walter Benjamin route with an Olympic torch. Dressed as if she was a pilgrim, she symbolically went through the path of exile to honor men, women and children who have suffered or suffer exile. With the torch, she went down the tunnel in the Passages Memorial by Dani Karavan, an artist awarded and well known in Japan. In the beach, a boat was burned, while she entered into the sea. The exiliated people appear here as Olympic winners, as Walter Benjamin. Desesperation leads them to burn the boats and to surrender to death. In Japan, tradition tells us that older people penetrate the forest in order to disappear. On September 11th, a book and a video of this performance was presented in the space White Conduit Projects in London. On Saturday 21st May we organised the lecture "The documents of Progreso-Portbouense Lodge" by Roger Olivella. 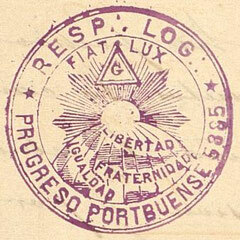 Progreso-Portbouense Lodge started its activities with the support of Masons from Figueres in the late ninetheenth century, coinciding with the birth of the village of Portbou. The Lodge had a remarkable participation in the village affairs. Part of the activity of the Lodge was recorded and finally deposited in the Salamanca's archives. The aim was to explain what these documents are, to display them, to know their authors and discover what kind of stories they tell us about Portbou. Place: Centre Cívic Ca l'Herrero, c/ Mendez Nuñez, 2. Starts at: 6 p.m. The association in collaboration with Portbou Town Hall has become member of the Club de Cultura i Identitat del Patronat de Turisme Costa Brava Girona in order to promote and disseminate the heritage and culture of this frontier territory.